December 30, 2009  President Obama has issued an executive order allowing for the declassification of millions of documents going back to the Cold War and World War II. It was the most decisive move made yet by a president who campaigned on promises he would bring a new era of openness and transparency to the White House. December 16, 2009  President Obama said while differences remain with the health overhaul bill, it is critical that the Senate Democratic caucus deliver the 60 votes needed to defeat a Republican filibuster to ensure passage. Obama, who once stressed the importance of bipartisan support for the bill, now knows he can't count on a single Republican vote. December 10, 2009  President Obama accepted the Nobel Peace Prize in Oslo on Thursday, saying he was at the beginning of his work on the world stage. He also refused to renounce war, saying he is obliged to protect and defend the U.S.
December 2, 2009  Republicans had accused President Obama of dithering rather than deciding how things should go in Afghanistan. The president took three months and convened many top-level meetings to consider strategy and troop levels. While there is support for the increased troop level, they do not think Obama should have set a timetable for withdrawing. December 1, 2009  President Obama announces Tuesday that he is sending 30,000 new troops to Afghanistan over the next six months, administration sources say. At a speech from the U.S. Military Academy at West Point, N.Y., Obama is expected to also discuss how long he thinks the U.S. mission will last. December 1, 2009  A presidential speech at West Point — the oldest of the service academies — carries a certain weight. It puts the focus on the role of commander in chief in a special way. Seven and a half years ago, President Bush used the venue to present an optimistic view of progress in Afghanistan and to introduce his "war on terror." November 25, 2009  As a sign of India's rising stature, Prime Minister Manmohan Singh was treated to the first state visit of Obama's presidency. The two leaders pledged to strengthen their economic ties, and Obama reiterated the importance of the U.S. relationship with India. During a news conference with Singh, Obama also addressed the topic of Afghanistan. November 24, 2009  President Obama said Tuesday he intends to finish the job in Afghanistan, adding he would soon announce his strategy for the country. The comments came in a joint news conference with Indian Prime Minister Manmohan Singh, who is on a state visit to the U.S.
November 24, 2009  President Obama and his top military and national security advisers gathered once again at the White House Monday night. The subject was troop levels and strategies for the war in Afghanistan, and there was also the question of how to deal with neighboring Pakistan. Sources say plans are underway for a possible announcement in a prime-time speech by the president next week. November 19, 2009  The Republican Governors Association is holding its annual meeting this week in Austin, Texas. Thanks to recent election victories in Virginia and New Jersey, Republicans are feeling good again. They plan to use those wins to help the party rebound in 2010. November 17, 2009  To sell Congress and others on the idea of taking bold steps to curb global warming, President Obama casts his arguments in terms of job creation. Many environmental activists say they wish he'd do more to push the "green" agenda. 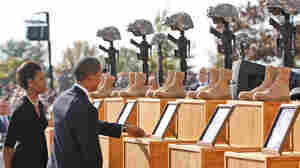 November 12, 2009  From his stop at Dover Air Force base to a visit to Walter Reed Army Medical Center to Wednesday's private visit to military grave sites, President Obama appears to feel the weight of war acutely as he considers U.S. options for Afghanistan. None are likely to be welcomed by the American public. November 5, 2009  The environment could hardly be better for Republicans — the out party typically scores big in off-year elections, particularly when the economy is flagging. The party sees a chance for big gains in next year's midterms, even as it deals with its own internal ideological battles.